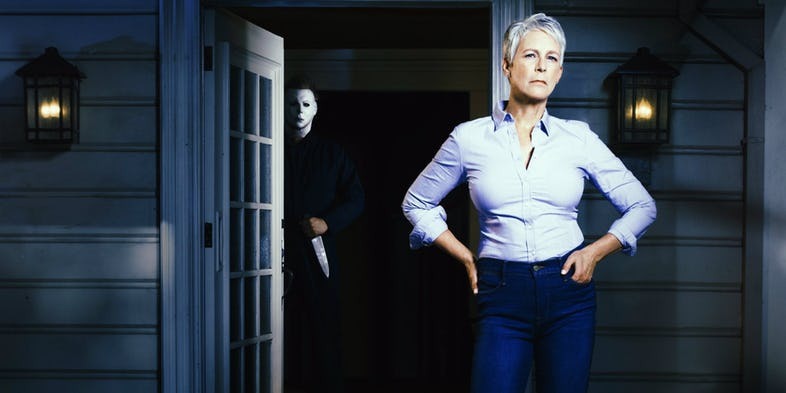 Jamie Lee Curtis Reveals Halloween Trailer at CinemaCon - Horror News Network - The Horror News You Need! Jamie Lee Curtis walked on stage and introduced the new Halloween trailer to the CinemaCon crowd at Caesars Palace in Las Vegas. Halloween picks up 40 years after the original film and disregards all sequels. Reprising her role as Laurie Strode, Curtis went on to say “Except for Star Wars, I can’t think of another movie where the same actor is playing the same role 40 years later.” As the venue went dark the trailer rolled and onlookers saw the asylum in which Michael is being kept. Laurie’s voice is heard saying “I pray every night that he would escape so that I could kill him.” Laurie gets her wish as Michael escapes and leaves behind carnage as only Michael can. The trailer abruptly ends as Haddonfield prepares for the ultimate showdown between slasher and final girl. Sources tell us that the trailer was extremely dark and scary. Jamie Lee Curtis also seemed genuinely excited about reprising her role as Laurie Strode. The film is produced by Jason Blum, Malek Akkad, and Bill Block. David Gordon Green, Danny McBride, and Jeff Fradley handled the writing duties. The picture is directed by David Gordon Green with music by John Carpenter. Keep it locked to Horror News Network for more news as it becomes available. With the film set to be released on October 19th we are expecting some sort of teaser trailer to be released relatively soon.